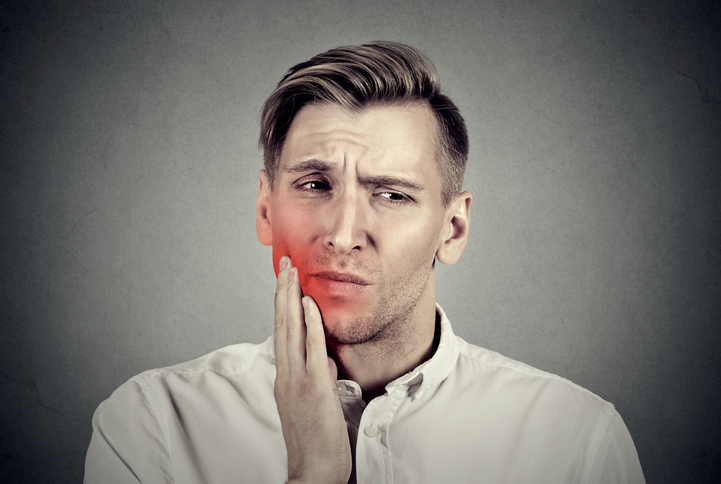 Getting a tooth pain after filling a tooth is quite common - I estimate around 50% of people will have some discomfort after getting a dental filling - but there's a BIG range of discomfort level, from slight sensitivity for a day or so to crippling toothache that does not settle down. What are the cures or remedies for this toothache? The cause of your pain is the nerve, buried inside the tooth, becoming inflamed. When the tooth nerve becomes inflamed, it tries to swell up, like anytime you hit your thumb with a hammer! BUT while your thumb CAN swell up when it's inflamed, your tooth nerve CANNOT swell up, because it's encased inside the body of the tooth. So, instead, the pressure inside the nerve goes up. The nerve becomes compressed, and starts to cause pain. How much pain you get depends on the cause of the inflammation. The first possibility is decay. Dentists call it "dental caries". Basically, this is bacteria in a cavity in your tooth. Just like a bacterial infection of a cut on your hand will be painful, a bacterial infection inside a tooth cavity will be painful too. Bacteria irritate the tooth nerve, causing inflammation and therefore pain. Sometimes I am asked why antibiotics cannot be used against infection inside a tooth. That's a very good question! But the answer is better. If an antibiotic is going to be effective against bacteria, you actually have to get the antibiotic TO the bacteria. In a tooth, there is NO blood supply to the enamel or dentine. There is only a blood supply to the nerve deep inside the tooth. But not to where the bacteria are. And so the antibiotic does not get to where it needs to go. But it's not just bacteria inside a tooth cavity that can cause a problem. When you get a filling done at a dentist's office, he should remove all the decayed dentine and therefore all the bacteria inside the cavity. BUT sometimes the dentist may MISS a small area of decay, and carry on to fill the tooth, accidentally leaving some bacteria behind. These bacteria will continue to cause decay under the new filling, leading to tooth pain after filling. If this continues for long, the bacteria will cause irreversible damage to the nerve, and the tooth will die. Your only options at that stage are extraction of the tooth OR root canal treatment. You can read more about these options at Getting a Tooth Pulled and Root Canal Procedure. The next possibility is a cracked tooth. If you get a crack in the tooth, bacteria can get down inside the crack even though it's microscopic. The tooth will become painful to bite on, and maybe to hot or cold things too. Assuming that there are NO BACTERIA inside the tooth, nor under the filling, then there are 2 remaining possibilities that could cause a tooth pain after filling. The first of these is that the filling may be a little bit too big. By that I really mean that the new filling may be a bit too high, so it meets the opposite tooth first when you bite your teeth together. So every time your teeth come together, the new filling will hit first. After a day or so the tooth will start to complain about all this pressure! It's like tapping your thumb with the end of a pencil in the same spot every 4 minutes. At first you don't notice it too much. But after a while your thumb would start to become tender in that spot. And it's exactly the same for your tooth! The fix is simple. Your dentist just needs to grind down the new filling a bit, until your other teeth are meeting properly. The final possible cause of tooth pain after filling is to do with the materials used and the techniques used by the dentist. There are essentially JUST TWO types of filling material for a tooth cavity. One of them is the old traditional silver mercury amalgam metal filling. The other is the more modern (but more demanding for the dentist to get right) tooth-coloured "composite" filling material. For BOTH materials the tooth cavity needs to be clean and dry during the whole time the new filling is going into the cavity. That means that any saliva getting in there during the procedure will affect the filling material. In metallic fillings, the saliva prevents the material from setting properly, and can result in slight expansion of the filling as it sets, causing pressure inside the tooth. With the tooth coloured "white" filling material, any saliva or moisture in the cavity during filling will interfere with the bonding agents used to "glue" the filling into place. These tooth-coloured fillings reply on the bonding agents to seal the cavity properly. If there is incomplete or inadequate bonding, then a microscopic micro-gap can open up under the filling, because the material contracts slightly when it sets - so it "pulls away" from the bottom of the tooth cavity surface. Again, this can cause a tooth pain after filling, especially when you bite on the tooth. One other cause of pain is incomplete curing of the tooth-coloured filling material; this filling needs to be "cured" or "set" with an ultra-violet light of a specific wavelength and power. The dentist must build up the new filling in layers, using the ultra-violet light to set each layer individually. If the dentist rushes the job and tries to build up layers that are too thick, the ultra-violet light will not get down to the deepest layers, and they will only be partially set. So the new filling is not set solid, and will "give" slightly when you bite on it. For all these problems, the only solution is to re-do the filling over. And get it right the second time around! I hope this explanation of the possible causes of tooth pain after filling a tooth helps to explain the problem, and give you some idea about possible solutions.